Minerals Beginning with "L" and "M"
JC7496. Libethenite, chrysocolla. Los Azules mine, San Miguel, Tierra Amarilla Chile. 4.5 x 7 cm 98g. $38.00. Dark green bladed libethenite crystals with scattering of tiny bright blue chrysocolla balls on them. JC4802. Linarite, caledonite?. Empress mine, Zinc Hill subdistrict, Darwin district, Inyo county, California. 3 x 3.5 cm 29g. $5.00 Bright blue linarite with traces of what appears to be caledonite from this rarely seen location for specimens. ON SALE, TAKE 20% OFF THE MARKED PRICE. JC7703. 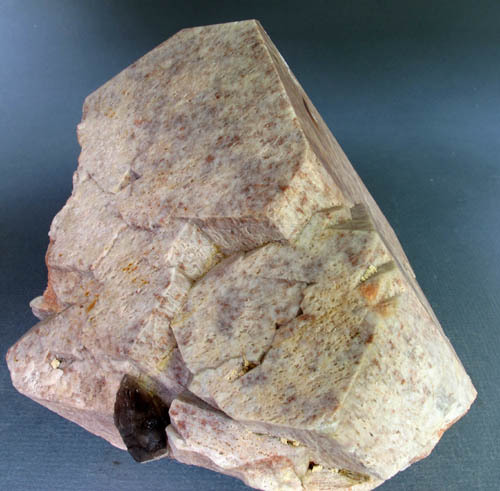 Limonite pseudo siderite. Crystal Creek, Teller county, Colorado. 4 x 6 cm 95g. $30.00. JC6037. 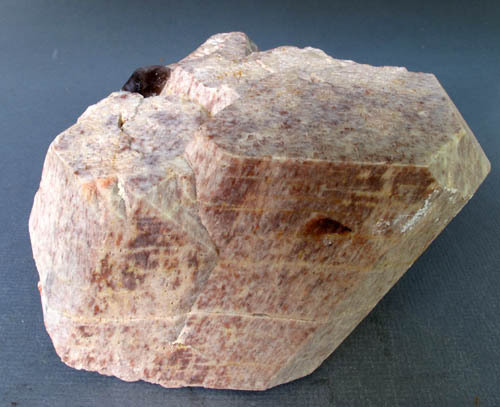 Ludwigite, calcite. Iron Mask (Spring Gulch, Valley View) mine, Quartzite (White Rock) canyon, Spring Mountain district, nr. Big Windy Peak, Lemhi county, Idaho. 2 x 5.5 cm 19g. $35.00 A 4 cm crystal in calcite. None of these crystals are terminated, which can be seen in etched specimens; for some reason they never terminated. Premier ludwigite locality in the world. ON SALE, TAKE 20% OFF THE MARKED PRICE. JC9195. Malachite, pyromorphite. Browns Open Cut, Rum Jungle, Batchelor, Coomalie Shire, Northern Territory, Australia. 5 x 8 cm 104g. $125.00. From the 2010 find at this open pit, now filled with water since 2012. Tiny, sparkly, micro crystals of pyromorphite heavily scattered over the dark green botryoidal malachite. No more of these are coming out. JC9317. Malachite pseudo Azurite. Milpillas mine, Cuitaca, Mun. de Santa Cruz, Sonora, Mexico. 5.5 x 9 cm 171g. $75.00. 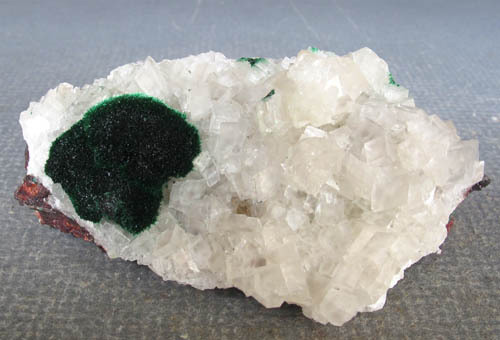 Bladed crystals of malachite pseudo after azurite. JC9233. Malachite pseudo azurite, azurite. Milpillas mine, Santa Cruz, Sonora, Mexico. 5 x 12 cm 229g. $175.00. Stubby azurite crystals replaced by malachite. A later generation of azurite left crystals scattered about on the two ends. Azurite is dark blue with bright luster. JC9233. Another view. Azurite crystals are visible on the left and right ends. JC9233. Close up of the left end. JC9233. Close up of the right end showing the azurite crystals. JC9233. Another view of the right end. JC9158. Malachite (primary). Kambove district, Katanga, Democratic Republic of Congo (Zaire) 5 x 10 cm 328g. $175.00. 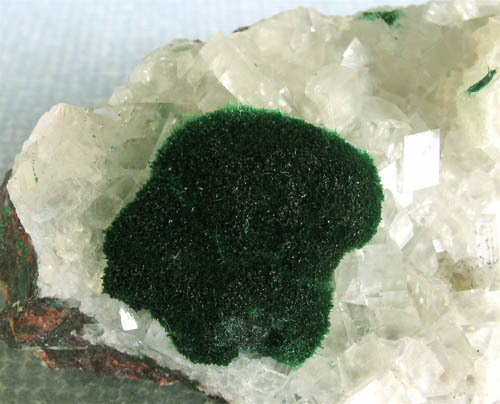 A vug filled with sparkly dark green primary malachite crystals. JC9033. Malachite pseudo azurite. Milpillas mine, Cuitaca, Municipio de Cananea, Sonora, Mexico. 3.5 x 4.5 cm. 43g. $15.00 Small azurite crystals totally replaced by chatoyant malachite on a white dickite? coating matrix. JC9072. Malachite. Katanga, Democratic Republic of the Congo. 6 x 6 cm 85g. $40.00 Not sure of the exact mine, so left it as Katanga. Brilliant, highly chatoyant malachite that changes reflectance at the slightest change in angle. Quite pretty and eye catching. Quite a few of these around the show, but very seldom do they have this much brilliance...the camera doesn't really give it justice. The white areas in the photos are where the light is reflective off the crystal faces. This one is a little different with its shape, and rather eye catching. JC9021. Malachite pseudo azurite. Milpillas mine, Cuitaca, Municipio de Cananea, Sonora, Mexico. 7 x 7 cm 190g. $20.00. Small azurite crystals totally replaced by malachite on a white dickite? coating matrix. JC9027. Malachite pseudo azurite. Milpillas mine, Cuitaca, Municipio de Cananea, Sonora, Mexico. 5.5 x 10.5 cm 109g. $75.00. 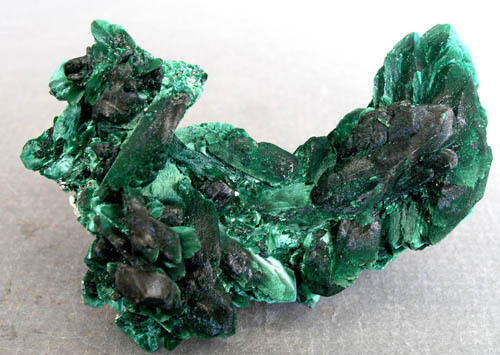 Plate of bladed azurite crystals completely replaced by chatoyant malachite. JC8952. Malachite pseudo azurite. Milpillas mine, Cuitaca, Mun. de Cananea, Sonora, Mexico. 2 x 3 cm 14g. $20.00 Nearly a single crystal. JC8485. Malachite pseudo azurite. Tsumeb mine, Tsumeb, Namibia. 4 x 5.5 cm 57g. $175.00. Several somewhat blocky crystals on brown matrix. Purchased in 1980. A bit of matrix attached to one crystal, otherwise undamaged except for crystal on bottom lower right where it appears to have been corroded or poorly formed...a little hard to tell. ON SALE, TAKE 20% OFF THE MARKED PRICE. JC8295. Malachite. Luishia mine, Katanga, Democratic Republic of the Congo. 5 x 7 cm 80g $80.00. Bright, chatoyant malachite sprays and crystals. Collected in 2000-2002 time period. JC8066. Malachite pseudo azurite. Sir Dominick mine, Yudnamutana district, Arkaroola region, North Flinders ranges, South Australia, Australia. 3 x 4.3 cm 39g. $125.00. A nice sharp three dimensional crystal group. Usually these are thumbnail size...it is rare to get a pseudo of good miniature size like this specimen. Although hard to tell from the photos, this is a nice sharp group, dominated by a main crystal with a square shape and other smaller pseudos sort of growing out of the face. JC7990. Malachite. Copper Queen mine, Bisbee, Warren district, Cochise county, Arizona. 7 x 16 cm 690g. $300.00. Nice large cabinet specimen of dark green velvet malachite coating hematitic matrix. No damage. JC7990. Close up of left end. JC7990. Close up of right hand end. JC7634. Malachite pseudo cuprite. Chessy- les-Mines, Rhone, Rhone-Alps, France. 1.4 x 1.5 cm 4g. $85.00. An octahedral crystal, with the malachite impregnated with sand grains, so the malachite only shows well on the edges of the crystal form. Hence the lower price. JC7622. Malachite pseudo azurite. Milpillas mine, Cuitaca, Mun. de Cananea, Sonora, Mexico. 2 x 2 cm 6g. $10.00 Dark bright green malachite, with chatoyant tendencies seen as white areas in the photos. ON SALE, TAKE 20% OFF THE MARKED PRICE. JC7624. Malachite pseudo azurite. Milpillas mine, Cuitaca, Mun. de Cananea, Sonora, Mexico. 1.8 x 3 cm 8g. $15.00. Dark bright green malachite, with chatoyant tendencies seen as white areas in the photos. ON SALE, TAKE 20% OFF THE MARKED PRICE. JC7625. Malachite pseudo azurite. Milpillas mine, Cuitaca, Mun. de Cananea, Sonora, Mexico. 2 x 3 cm 8g. $10.00 Dark bright green malachite, with chatoyant tendencies seen as white areas in the photos. ON SALE, TAKE 20% OFF THE MARKED PRICE. JC7628. Malachite pseudo azurite. Milpillas mine, Cuitaca, Mun. de Cananea, Sonora, Mexico. 3 x 5 cm 21g. $20.00 Dark bright green malachite, with chatoyant tendencies seen as white areas in the photos. ON SALE, TAKE 20% OFF THE MARKED PRICE. JC7629. Malachite pseudo azurite. Milpillas mine, Cuitaca, Mun. de Cananea, Sonora, Mexico. Dark bright green malachite, with chatoyant tendencies seen as white areas in the photos. 2.5 x 3.5 cm 17g. $20.00 ON SALE, TAKE 20% OFF THE MARKED PRICE. JC7654. Malachite pseudo azurite. Tsumeb, Namibia. 4 x 6 cm 84g. $60.00. Although hard to tell in the photos, the face of this piece is covered with short stubby pseudos of malachite. Two views are shown. The light green material appears to be bayldonite or mottramite; not verified. ON SALE, TAKE 20% OFF THE MARKED PRICE. JC7648. Malachite. Shinkalobwe, Katanga, Democratic Republic of the Congo. 2 x 2.8 cm $10.00 ON SALE, TAKE 20% OFF THE MARKED PRICE. JC7417. Malachite. Mubambe mine, Katanga, Democratic Republic of the Congo. 7 x 8 cm 224g. $80.00. This one caught my eye just for its sheer beauty. One small scratch on the upper right botryoids, visible in the photo below. A real pretty specimen. ON SALE, TAKE 20% OFF THE MARKED PRICE. JC7341. Azurite pseudo malachite, azurite. Milpillas mine, Cuitaca, Sonora, Mexico. 6 x 12 cm tall. 366g. $300.00. A nice large plate of sharp, bladed malachite standing perpendicular to the matrix, formed in a shallow vug. Dozens of pseudos on this one. The bottom of the piece was in contact with the pocket wall, so the malachite is flat and not well crystallized. There are a couple of minor dings to a couple of the crystals, visible, with difficulty, in the close up shot. Not often do you see a nice sized cabinet specimen of sharp, bladed pseudos on it like this. There is some massive, blue azurite underneath the malachite and visible from the back side of the specimen. JC3859. Malachite, calcite. Tsumeb mine, Tsumeb, Namibia. 4 x 7 cm 85g. $150.00 A 2 cm ball of acicular malachite on white calcite rhombohedra. Neat piece with no damage to the naked eye except for a very small patch on the bottom edge of the malachite where it was cleaved when removed from the pocket. This is visible in the bottom photo. ON SALE, TAKE 20% OFF THE MARKED PRICE. JC5096. Malachite pseudo azurite. Milpillas mine, Sonora, Mexico. 3 x 5 cm 33g. $100.00. Cute pseudomorph, with good sharp crystals of azurite replaced by the malachite. ON SALE, TAKE 20% OFF THE MARKED PRICE. JC4980. Malachite pseudo azurite. Emke mine, Onganja, Namibia. 4 x 5 x 6 cm 82g. $250.00. Sharp green pseudos, with nice chatoyancy. Nice and 3 dimensional, which is hard to tell from the photo. Very rarely are these offered for sale, and usually quite expensive. These are all pseudos after azurite, with several crystals present. ON SALE, TAKE 20% OFF THE MARKED PRICE. JC7796. Marcasite, pyrargyrite, quartz. Rosebud mine, Rosebud district, Pershing county, Nevada. 5 x 6.5 cm 55g. $45.00 Marcasite in bladed crystals has been partially coated with massive to microcrystalline pyrargyrite. A rare combination. ON SALE, TAKE 20% OFF THE MARKED PRICE. JC7658. Marcasite. Julcani district, Angaraes province, Huancavelica department, Peru. 4.5 x 5 cm 79g. $30.00. Noted for its pyrite and other sulfides, Julcani has rarely produced specimens of marcasite. This is a nice sharp example with excellent bright crystals. JC7686. Mesolite, stilbite. Kannad, Aurangabad, Maharashtra, India. 4.5 x 7.5 cm 73g. $50.00. Nice ball of waxy luster mesolite. Unusual. JC6282. Microcline. Crystal creek, Teller county, Colorado. 8.5 cm tall x 12cm deep x 10 cm wide. >1000g. $35.00. A quite large crystal from this area...wish it were amazonite. A small smoky quartz is attached on one side. A crack through the bottom has been reinforced with super glue. Collected in 2006 ON SALE, TAKE 20% OFF THE MARKED PRICE. JC6281. Microcline. Crystal creek, Teller county, Colorado. C: 2006. 5 x 6 x 7.5 cm 374g. $15.00. Nice sharp microcline crystal with one attached on the side. JC8187. Microlite, muscovite, albite Amelia (Amelia Court House), Amelia county, Virginia. 6 x 7 cm 127g. $125.00. 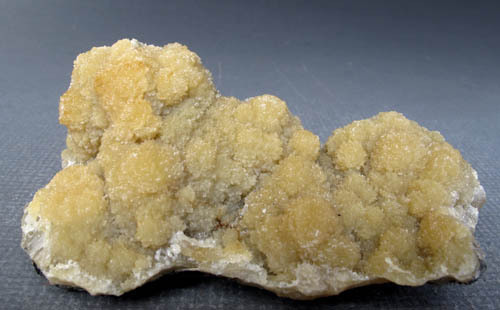 several resinous brownish crystals in an albite/muscovite matrix. Collected in 1957. Ex Rapp collection. Rarely seen for sale anymore, this is a very good matrix specimen for the Amelia location. ON SALE, TAKE 20% OFF THE MARKED PRICE. JC9759. Mimetite. Guatomo mine ('Hat Yai' mimetite locality), Tham Thalu, Bannang Sata district, Yala province, Thailand. 5 x 10 cm 340g. $175.00. Bright, lemon yellow crystals. Some broken crystals on the periphery and scattered across the specimen; not obvious but present. JC9515. Mimetite. Bilbao mine, La Blanca, Municipio de Ojo Caliente, Zacatecas, Mexico. 6.5 x 6.5 cm 341 g. $250.00. A solid and heavy mass of mimetite in botryoidal form from this long defunct location. The botryoids on top are a pale green with hints of yellow, while the bottom of the specimen is bright botryoids of more yellow to yellow green mimetite. Good piece, rarely seen for sale in this quality. JC9515. Side view. There is a secondary growth of mimetite in sparkly little micro-crystals on the sides of some of the botryoids. JC9515. Bottom of the specimen. JC9492. Mimetite. Tsumeb, Namibia. 12.5 x 13cm 888g. $285.00. Lots of mimetite on this one. Nice large cabinet specimen completely coated with pale yellow to cream colored crystals. Displays well. JC9492. close up of one side. JC9492. Close up of top portion. JC9492. Close up of bottom left...a bit of malachite shows in this one. JC9304. Mimetite. Tsumeb mine, Tsumeb, Namibia. 5.5 x 7 cm 132g. $150.00. A solid mass of sparkly light yellow mimetite makes up this piece. In this view the dark area is much lighter in color than the photo would indicate, and is made up of mimetite crystals with some type of dark inclusion. A small wulfenite? crystal is located in the front part of the dark area. The mimetite crystals extend all the way around the specimen as shown in the photos below. JC9304. Another view, front side, tipped back slightly. JC9304. Another view of the front side, with the top angled back to show the basal area. JC9213. Mimetite. Tsumeb mine, Tsumeb, Namibia. 4.5 x 7.5 cm 5g. $40.00. Prismatic yellow crystals. JC9057. Mimetite, hemimorphite, willemite. M'Fouati mine, M'Fouati district, Bouenza department, Dem. Rep. of the Congo. 7 x 10.5 cm 774g. $350.00. A rare and large combination from this district. Mimetite is very rare from here, with glassy, sparkly, spherical aggregates of goldenrod-yellow crystals on all sides. A rosette of glassy light blue hemimorphite blades at the top looks like a capping on a Christmas tree. Small blades of hemimorphite are also scattered through the mimetite. JC9037. Mimetite. Filon Sur Cut, Minas de Tharsis, Alosno, Comarca, El Andevalo, Huelva, Andalusia, Spain. 2.5 x 5 cm 52g. $50.00. I picked this one up, as I had never heard of the this location. A limited find it turns out when I Googled the location. JC8869. Mimetite, wulfenite. Ojuela mine, Mapimi, Durango, Mexico. 2.5 x 3.5 cm 14g. $15.00 From the find of spring 2013. No damage. Several wulfenite crystals are present. JC8870. Mimetite. Ojuela mine, Mapimi, Durango, Mexico. 2.8 x 3 cm $12.00 From the find of spring 2013. Very minor rubbing on a couple of the knobs...not obvious. JC8871. Mimetite. Ojuela mine, Mapimi, Durango, Mexico. 1.5 x 3.5 cm 21g. $15.00 From the find of spring 2013. There are a couple of broken knobs on the extreme right of the specimen. JC8872. Mimetite. Ojuela mine, Mapimi, Durango, Mexico. 2 x 3 cm 19g. $10.00 From the find of spring 2013. One broken knob on the back of the front, very minor damage to the lower front. JC8876. Mimetite. Ojuela mine, Mapimi, Durango, Mexico. 1.5 x 3 cm 14g. $10.00 From the find of spring 2013. Fairly clean. Broken wulfenite crystal on the far right, as can be seen in the photo. JC8877. Mimetite. Ojuela mine, Mapimi, Durango, Mexico. 1.5 x 3.1 cm 21g. $5.00 From the find of spring 2013. Two of the topmost knobs have been sheared off. JC8877. Another view. Damage can be seen as flat area on the top of the two central knobs. JC8878. Mimetite. Ojuela mine, Mapimi, Durango, Mexico. 2.8 x 3.5 cm 32g. $15.00. Broken crystal knob in the front, easily visible. From the find of spring 2013. JC8881. Mimetite. Ojuela mine, Mapimi, Durango, Mexico. 2 x 3 cm 20g $5.00. Broken knobs across the front, easily seen in the photo. From the find of spring 2013. JC8883. Mimetite. Ojuela mine, Mapimi, Durango, Mexico. 2.1 x 2.8 cm 17g. $7.00. Broken knobs across the middle, easily visible in the photo. From the find of spring 2013. JC8884. Mimetite. Ojuela mine, Mapimi, Durango, Mexico. 2.3 x 3 cm 20g. $15.00. Broken knob on the extreme left, easily seen in the photo. JC8885. Mimetite. Ojuela mine, Mapimi, Durango, Mexico. 2 x 2.4 cm 20g $15.00. Broken knob in the center, easily visible in the photo. From the find of spring 2013. JC8886. Mimetite, wulfenite. Ojuela mine, Mapimi, Durango, Mexico. 2 x 3 cm 17g. $7.00. A few broken knobs. From the find of spring 2013. JC8888. Mimetite. Ojuela mine, Mapimi, Durango, Mexico. 2 x 2.5 cm 13g. $12.00 From the find of spring 2013. No damage. JC8889. Mimetite. Ojuela mine, Mapimi, Durango, Mexico. 2.5 x 3.5 cm 19g. $5.00. A few broken knobs. From the find of spring 2013. JC8890. Mimetite. Ojuela mine, Mapimi, Durango, Mexico. 2.5 x 3 cm 28g. $12.00 From the find of spring 2013. Minor rubbing as seen as white spots in the photo. Broken knobs on the lower right front. JC8891. Mimetite. Ojuela mine, Mapimi, Durango, Mexico. 2.5 x 3 cm 12g. $10.00. From the find of spring 2013. Very minor rubbing on one knob. JC8778. Mimetite, duftite. Tsumeb, Namibia. 5 x 7.5 cm 238g. $60.00 Nearly solid mass of mimetite with duftite scattered on and around the yellow mimetite crystals. ON SALE, TAKE 20% OFF THE MARKED PRICE. JC9118. Mimetite. Santa Eulalia, Chihuahua, Mexico. 7 x 10 cm 261g. $65.00. Bright yellow crystals with satiny to waxy luster. Older piece. ON SALE, TAKE 20% OFF THE MARKED PRICE. JC8501. Mimetite, wulfenite, calcite. Ojuela mine, Mapimi, Durango, Mexico. 7 x 8 cm 285g. $40.00 Green pseudo botryoidal somewhat sparkly mimetite with a few scattered orange wulfenites and mostly colorless calcite. JC8498. Mimetite. Tsumeb, Namibia. 4 x 5 cm. 85g. $65.00 Collected in 1967. Purchased in that year from Crystal Gallery. Acicular amber crystals with what appears to be an earlier formation of bright yellow crystals. JC8470. Mimetite. Santa Eulalia, Chihuahua, Mexico. 8 x 13 cm 449g. $35.00 Pale yellow needle crystals with small calcite rhombs on the back. Mimetite covers all the front and most of the back. JC8470. Close up view, left central area. JC8470. Close up view, right side. JC8231. Mimetite. Santa Eulalia, Chihuahua, Mexico. 7 x 9 cm 304g. $70.00. Heavy specimen of slightly botryoidal to more globular/cauliflower like crystals. Color varies from yellow to a dark honey color. Not sure what the black mineral is. An older specimen from here, somewhat different from what has more recently been collected. Ex Muhl Herdorf, Germany, collection. ON SALE, TAKE 20% OFF THE MARKED PRICE. JC8255. Mimetite. Ojuela mine, Mapimi, Durango, Mexico. 2 x 4.3 cm 30g. $25.00. From the find of the spring of 2013. These are a bright yellow, with great luster. No damage except on the edges. These add a nice bright spot to any collection. Brighter yellow than the photo would indicate. ON SALE, TAKE 20% OFF THE MARKED PRICE. JC8256. Mimetite. Ojuela mine, Mapimi, Durango, Mexico. 2 x 3.5 cm 14g. $15.00. From the find of the spring of 2013. These are a bright yellow, with great luster. No damage except on the edges. These add a nice bright spot to any collection. ON SALE, TAKE 20% OFF THE MARKED PRICE. JC8257. Mimetite. Ojuela mine, Mapimi, Durango, Mexico. 3 x 4 cm 29g. $10.00. From the find of the spring of 2013. These are a bright yellow, with great luster. No damage except on the edges. These add a nice bright spot to any collection. ON SALE, TAKE 20% OFF THE MARKED PRICE. JC8258. Mimetite. Ojuela mine, Mapimi, Durango, Mexico. 2 x 3 cm 12g. $10.00. From the find of the spring of 2013. These are a bright yellow, with great luster. No damage except on the edges. These add a nice bright spot to any collection. ON SALE, TAKE 20% OFF THE MARKED PRICE. JC8259. Mimetite. Ojuela mine, Mapimi, Durango, Mexico. 2.5 x 3.5 cm 21g. $15.00. From the find of the spring of 2013. These are a bright yellow, with great luster. No damage except on the edges. These add a nice bright spot to any collection. ON SALE, TAKE 20% OFF THE MARKED PRICE. JC8261. Mimetite. Ojuela mine, Mapimi, Durango, Mexico. 7 x 8 cm 303g. $250.00. From the find of the spring of 2013. These are a bright yellow, with great luster. No damage except on the edges. These add a nice bright spot to any collection. This is one of the best of the lot in my opinion. ON SALE, TAKE 20% OFF THE MARKED PRICE. JC8262. Mimetite. Ojuela mine, Mapimi, Durango, Mexico. 7 x 9.5 cm 324g. $75.00. From the find of the spring of 2013. These are a bright yellow, with great luster. No damage except on the edges. These add a nice bright spot to any collection. ON SALE, TAKE 20% OFF THE MARKED PRICE. JC8264. Mimetite. Ojuela mine, Mapimi, Durango, Mexico. 6.5 x 8 cm 88g. $125.00. From the find of the spring of 2013. These are a bright yellow, with great luster and sparkle. No damage except on the edges. These add a nice bright spot to any collection. ON SALE, TAKE 20% OFF THE MARKED PRICE. JC8265. Mimetite. Ojuela mine, Mapimi, Durango, Mexico. 7 x 8 cm 287g. $125.00. From the find of the spring of 2013. These are a bright yellow, with great luster and sparkle. No damage to the crystals except on the edges and a brown patch on the left side where the crystals apparently fell off. These add a nice bright spot to any collection. ON SALE, TAKE 20% OFF THE MARKED PRICE. JC8265. Another view. The little piece extending out from the lower right appears to have a crack in the photo, this is not the case and just a trick of the lighting. JC7932. Mimetite. Tsumeb mine, Tsumeb, Namibia. 6 x7 cm 175g. $200.00 Nice group of tannish to honey colored crystals. ON SALE, TAKE 20% OFF THE MARKED PRICE. JC7283. Mimetite, wulfenite. Tsumeb, Namibia. 7 x10 cm 229g. $200.00 Acicular yellow to yellow brown crystals with a wulfenite implanted in the center. Several of the mimetites are broken, not uncommon in larger older pieces like this. Ex BobTrimingham collection. ON SALE, TAKE 20% OFF THE MARKED PRICE. JC7283. Side view. The wulfenite crystal is about dead center. JC7283. Close up of the wulfenite crystal. JC6865. Mimetite. Tsumeb mine, Tsumeb, Namibia. 4.2 x 8.3 cm wide. 270g. $150.00 Pale yellow, sparkly, somewhat botryoidal mimetite. There is some damage to the topmost left side mound right on its top, probably from the pocket wall; not visible in the photo. ON SALE, TAKE 20% OFF THE MARKED PRICE. JC6534. Mimetite. Tsumeb, Namibia. 5 x 7 cm 255g. $95.00. Pale yellow drusy crystals. ON SALE, TAKE 20% OFF THE MARKED PRICE. JC6268. Mimetite. Tsumeb mine, Tsumeb, Namibia. 2.5 x 3.5 cm 34g. $5.00. Acicular yellow crystals. ON SALE, TAKE 20% OFF THE MARKED PRICE. JC4583 Mimetite. Tsumeb, Namibia. 3 x 4 cm 77g. $15.00. Brilliant, silvery, acicular mimetite crystals with lots of sparkle. ON SALE, TAKE 20% OFF THE MARKED PRICE. JC3754. Mimetite. Pingtouling mine, Liannan, Guangdong province, China. 3 x 4.7 cm 23g. $15.00. Several sharp, distinct crystals on gossan. ON SALE, TAKE 20% OFF THE MARKED PRICE. JC3900. Mimetite, mottramite, calcite. Tsumeb mine, Tsumeb, Namibia. 6 x 9.5 cm 240g. $75.00. Bright yellow crystals with dark olive green mottramite and white calcite. The calcite fluoresces a bright magenta color. Backside is also coated with mimetite ON SALE, TAKE 20% OFF THE MARKED PRICE. JC3900. Back side. Damage to the mimetite on this side. JC4451. Mimetite. Tsumeb, Namibia. 3.5 x 5 cm 56g. $75.00. 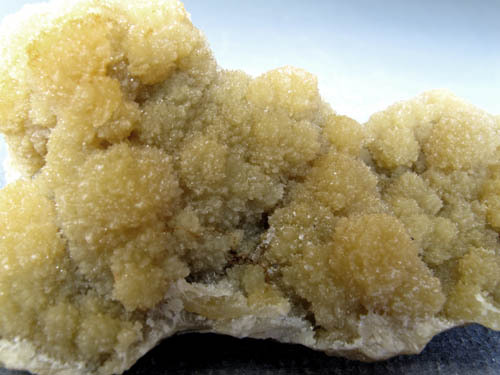 Gemmy, pale yellow crystals with some bluish unknown associated. Bright and sparkly. ON SALE, TAKE 20% OFF THE MARKED PRICE. JC4069. Mimetite. Tsumeb, Namibia. 4.5 x 5 cm. 22g. $25.00. Cauliflower like aggregates on a flat piece of matrix. Light yellow color. Quite sparkly ON SALE, TAKE 20% OFF THE MARKED PRICE. JC3787. 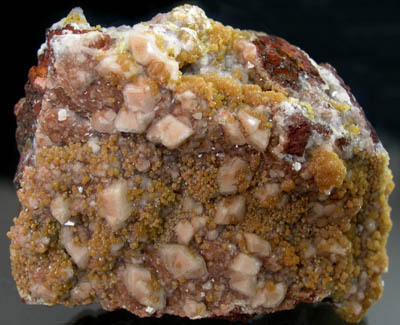 Mimetite, calcite. Ojuela mine, Mapimi, Durango, Mexico. 5 cm x 7 cm. 169g. $25.00. White rhombs of calcite with yellow orange mimetite scattered around. ON SALE, TAKE 20% OFF THE MARKED PRICE. JC3748. Mimetite epimorph after cerussite. Tsumeb, Namibia. 4.4 cm x 6 cm 131g. $350.00. The cerussite crystals are completely coated with bright yellow mimetite. A little of the cerussite shows in the lower left part of the photo. Nice specimen that displays well. The mimetite is slightly lighter in tone than the photo shows. ON SALE, TAKE 20% OFF THE MARKED PRICE. JC3735. Mimetite. Tsumeb, Namibia. 3 cm x 5 cm. tall. 78g. $250.00 Stalactite like group, of light yellow with a slight golden tint (honey yellow). ON SALE, TAKE 20% OFF THE MARKED PRICE. JC3860. Mimetite. Tsumeb, Namibia. 6 cm x 7 cm 103g. $125.00. Nice groupings of light yellow crystals. ON SALE, TAKE 20% OFF THE MARKED PRICE. JC8630. Muscovite pseudo microcline, schorl. Erongo mountain, Erongo region, Namibia. 5 x 7 cm 52g. $85.00. Sort of a combination of pseudo and epimorph after microcline. Some of these are hollow, while the muscovite shows the obvious microcline form. Scattered schorl crystals decorate the muscovite. ON SALE, TAKE 20% OFF THE MARKED PRICE. JC7984. Muscovite. Minas Gerais, Brazil. 13 x 16 x 20 cm >1000g. $300.00. A very nice group of muscovite crystals with hints of lilac on the crystals as can be seen in the photos. A rather impressive large group of nice crystals. Pretty piece. There is some rubbing on the top edge of six of the crystals. Can be seen a little in the photos as white areas on the top edges. ON SALE, TAKE 20% OFF THE MARKED PRICE. JC7850. Mushistonite, kesterite. Mt Xuebaoding, Pingwu Co., Mianyang Prefecture, Sichuan Province, China. 2 x 2.7 cm $200.00 Nice thumbnail cluster of this rare mineral. ON SALE, TAKE 20% OFF THE MARKED PRICE.